Just in time for Mardi Gras! 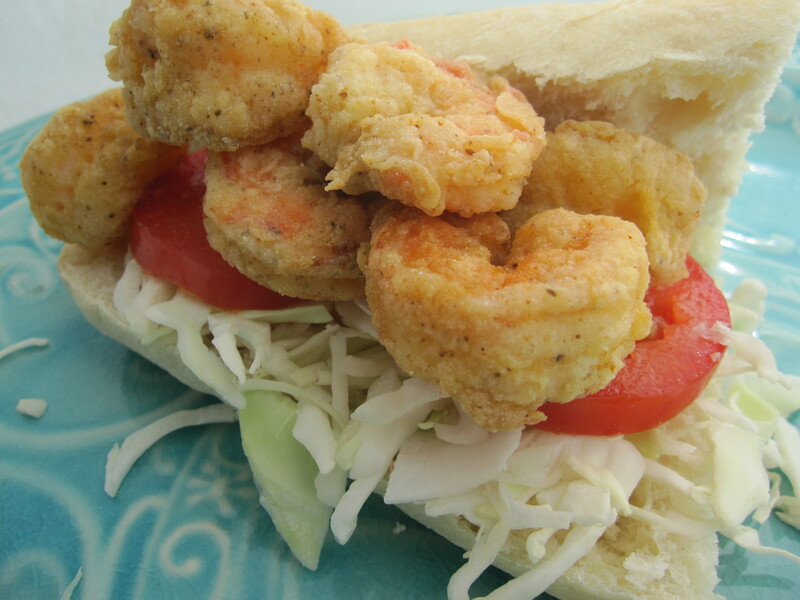 How can you not love a shrimp po’ boy? This is a simple sandwich with big flavor and best of all it’s easy to make. Heat the oil in a large sauce pan or preheat a deep fryer to 350 degrees . Season the shrimp with salt and pepper and set side while you set up breading station. In a medium mixing bowl combine the flour and masa harina and season with old bay, salt, cayenne, and season salt. In a separate dish, add eggs with hot sauce and whisk. Dip the shrimp in the egg wash then dredge in the seasoned flour mixture, coating the shrimp completely. Fry the shrimp in the hot oil, in batches if necessary, until golden brown about 4 minutes. Remove from the oil and drain on a paper towel. To assemble sandwich, split the French bread and spread mayo on both sides. Add lettuce, tomato, and shrimp. If my lettuce looks a little odd in the pic, it’s because I ran out of lettuce and had to use coleslaw mix. Still good, but I prefer shredded lettuce for this. Sprinkle with additional hot sauce if you like. You can also toast the bread with a little butter if you want an extra crunch. Try this also with tartar sauce or remoulade. Happy Fat Tuesday! If I ate shrimp this would be awesome. It looks good but I can’t get past the “fishiness” of seafood. I thin it is because I only had Grade F fish sticks and slimy white fish as a kid… yuck! Oh this so reminds me of New Orleans! I went last year and haven’t been able to get it out of my mind. I cannot wait to try this. You have inspired me! I absolutely love seafood, but have never had any type of seafood sandwich, mainly because I just think of fast food fish sandwiches. But this Po’ Boy looks so delicious and sounds so easy to make that I wish I was in my kitchen right now! I wonder how coleslaw would taste instead of shredded lettuce…or is that violating a certain Po’ Boy code? Thanks! I think coleslaw would taste great. I’ve seen some made with coleslaw instead of just lettuce. Ooh, I can’t wait to try these! Thanks, pretty girl! 🙂 I’ll try the beignets one weekend. P.S. Congrats on being Freshly Pressed! Yum ! This looks so good !!! I made the Shrimp Po’Boys for dinner tonight. It was a big hit, and oh, so easy! I had just about all the ingredients on hand anyway.Used fresh spinach leaves instead of cabbage or lettuce. Even my youngest, 3, tried, and liked, shrimp for the first time! Yay me! That sounds yummy. I have to try it with spinach! MY GAWD!!! This looks good! Better than any restaurant version I’ve tried. Thanks for the recipe. I’m looking forward to trying it.